Renal corpuscle. The entire structure is the renal corpuscle. The blue structure (A) is the Bowman's capsule (2 and 3). The pink structure is the glomerulus with its capillaries. At the left, blood flows from the afferent areteriole (9), through the capillaries (10), and out the efferent arteriole (11). 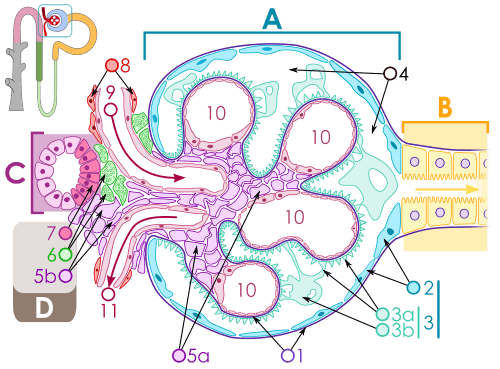 The mesangium is the pink structure inside the glomerulus between the capillaries (5a) and extending outside the glomerulus (5b). Intraglomerular mesangial cells are specialized pericytes located among the glomerular capillaries within a renal corpuscle of a kidney. Mesangial cells are of monocyte or smooth muscle origin, typically covering 30% of glomerular capillaries. They are both vimentin and desmin positive. There are three primary functions of intraglomerular mesangial cells: filtration, structural support, and phagocytosis. Additionally, mesangial cells are able to monitor glucose levels via processes sent into the capillary lumen. Intraglomerular mesangial cells provide structural support for and regulate blood flow of the glomerular capillaries by their contractile activity. The initiation of contraction of mesangial cells is similar to that of smooth muscle. Contraction of mesangial cells is coupled with contraction of the basement membrane of the endothelium of glomerular capillaries. This causes a decrease in surface area of the basement membrane and thus a decreased glomerular filtration rate. Intraglomerular mesangial cells are also major contributors to the extracellular matrix which contains fibronectin, type IV collagen, perlecan, and laminin. Mesangial cells also phagocytize glomerular basal lamina components and immunoglobulins. They are an unusual example of phagocytic cells derived from smooth muscle and not monocytes. Mesangial cells aid neutrophils in removing other mesangial cells undergoing apoptosis and also other debris in the glomerulus.